If I’m going to make chicken & mashed potatoes, then this is my husband Mike’s favorite dish. It’s another recipe from Guy Fieri (we LOVE GUY!) and I follow it pretty closely with just a few changes. His recipe uses pork loin and you’ll never really find pork in our house other than bacon and even that’s pretty rare. He also uses red wine and because we’re not fans of that either we never have it around. Regardless, this recipe is certainly not missing anything for taste. I serve it with garlic mashed potatoes and drizzle some of the gravy that’s used on the chicken on the mashed potatoes too. Set up your chicken breading station. You will need three shallow, wide bowls. I actually like to use pie pans for this step. In bowl one mix together 3/4 cup flour, salt, pepper, garlic, and paprika. In bowl two combine egg, milk, & mustard and use fork to mix ingredients. In bowl three add panko. In a medium saute pan cook the bacon until crispy. Remove the bacon with a slotted spoon and let drain on paper towels. Using the same pan with the leftover bacon grease, sauté the onion for about three minutes. Add the mushrooms and cook an additional two minutes. Stir in the remaining 1/4 cup of flour and cook for another couple of minutes. Add the beef broth and allow to thicken. 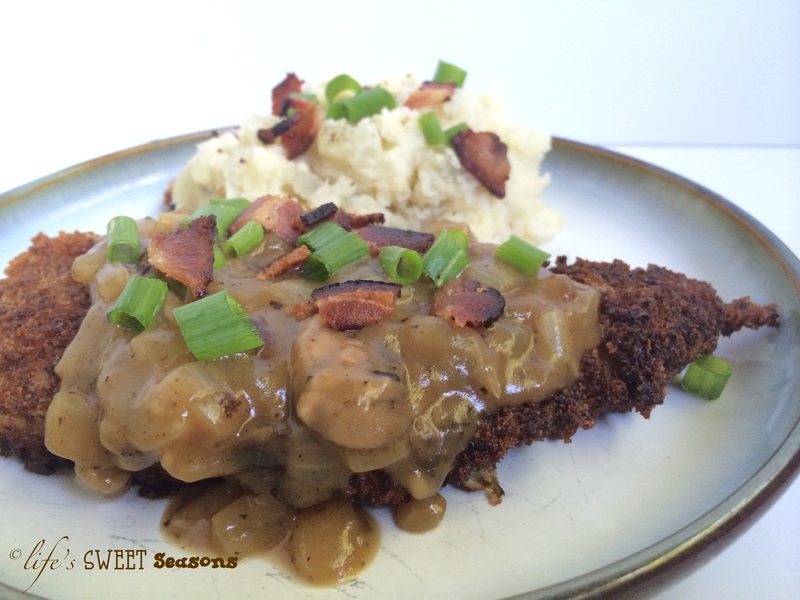 The gravy will turn from a thin dark brown sauce to a thicker sauce that’s lighter in color. Turn down to medium-low heat. Heat 1/4 inch of olive ion in a large sauté pan over medium-high heat. Cook the chicken breasts until golden brown on both sides, five minutes on the first side and four minutes on the second. As you pull them out of the pan place them in the heated oven to keep them warm until the others are done and to guarantee that they cook all the way through. 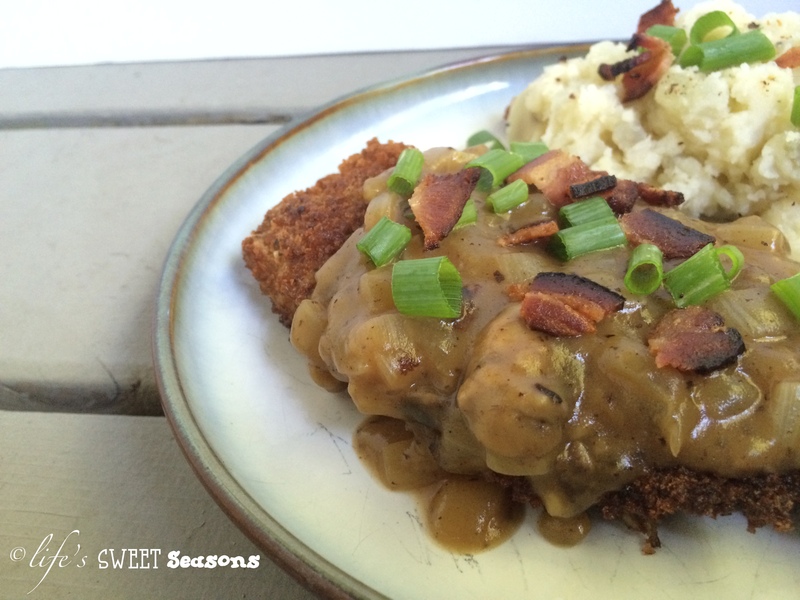 To serve, cover chicken with mushroom gravy, sprinkle with bacon pieces and green onions.